Allysen is a large 20" interactive doll who speaks to you, and while she speaks her eyes blink, and her mouth and face moves. Her face and hands are made of vinyl but feel very realistic to skin. Her legs and body are made of hard plastic and she is quite a heavy doll. Allysen is dressed in her original interactive purple top, jeans and purple and white runners. We have put the required batteries in her - 4 AA & 3AA, and she works. We only have one cassette which slips into the back of her, and no accessories like her "smoothy cup" or mobile which she asks for. We do not have any instructions for her but have found that she has sensors in her hand, hair and clothing. She also has a microphone in her stomach. Through the sensors she recognises her accessories - if she had any. To get her started you just press the sensor in Allysen's hand, and she will then start to talk to you, and you talk back to her. What is your favour colour? What holidays are coming up? How far off is your birthday? I'm going to take a nap now, if you want me to wake up just squeeze my left hand. That was a nice snooze. She is really a very interesting doll. These dolls were originally sold for over $100 so grab a bargain. She does not come with any accessories, but they can be purchased secondhand on Ebay. She will not come with any batteries, so you will need to put your own inside her to make her work. 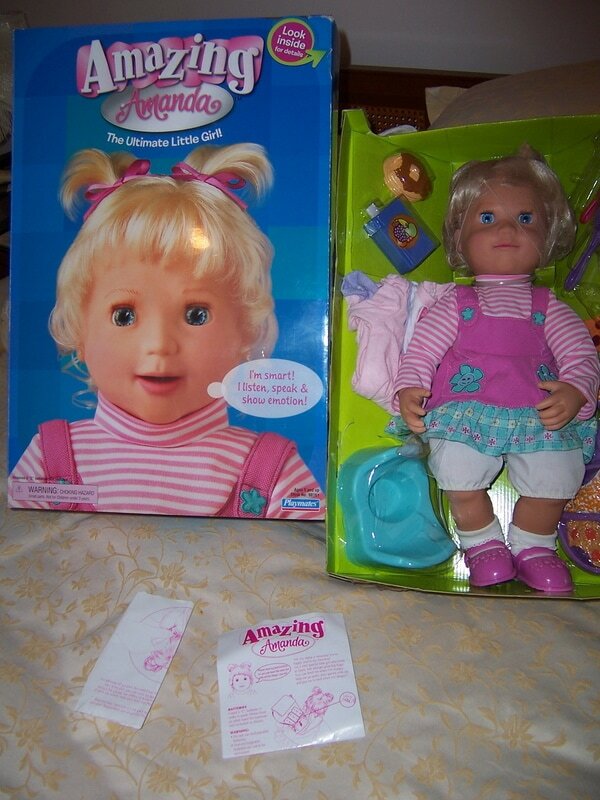 This is an extremely rare interactive doll called ''Amazing Amanda'' in her original box with items looking as though they have not been used much or even at all. She still has her original hair nets on her head. The original price sticker on the box for this doll is $249.00. ''Amazing Amanda brings out the mummy in every little girl''.
. learns to recognise her ''mommy's voice''. .recognizes objects such as her outfits, toothbrush, hairbrush, potty etc. .expreses emotions such as smiling when happy or pouting when told ''no''. .engages in two way communication with facial expressions and toddler talk. .asks to go to the potty and can be used for toilet training. .has an internal clock which can be used as an alarm cloth and may help establish a normal sleeping and waking schedule for your child. .comes with lots of accessories, and a nightie for bedtime. .requires 3 ''C'' batteries (not included). .recommended for ages 5 and up. We have tested her and she works. She comes with her original instruction sheet so very easy to set her up for your child. This is a rare preowned playpack set of accessories for Amazing Amanda interactive Playmates doll of 2005. It is a "Birthday Party Playpack". It comes with everything that Amanda will need for her birthday party. Perfect accessory for Amazing Amanda doll. 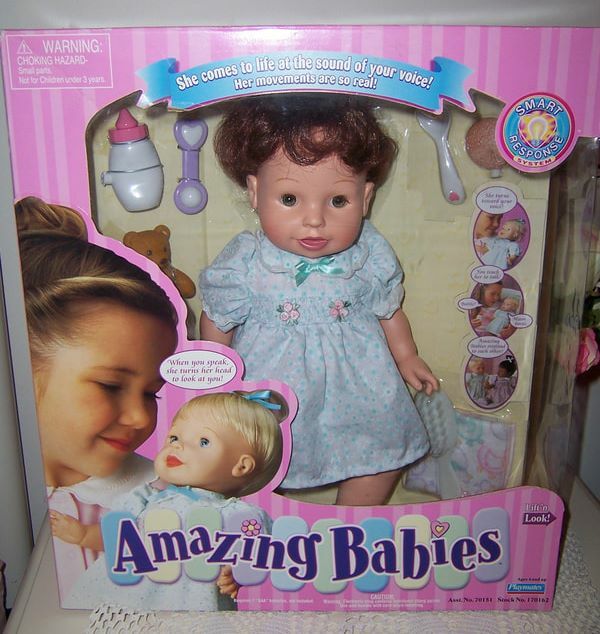 Playmates Amazing Baby interactive dolls respond to sound. They actually turn their heads and look at you when you speak. They recognize objects when put in their hands. When another Amazing Baby comes over to play she recognized your baby and her accessories - then responds, listen as they giggle, chat , and learn from each other. 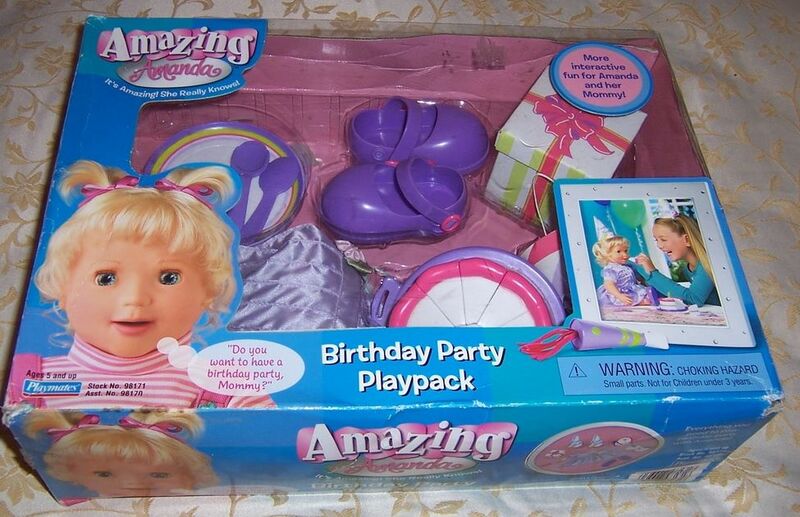 Amazing Baby was one of the best selling toys in the 2000 holiday season. They are adorable and so sweet looking. She is approx 38cm tall and is made of hard vinyl. She is jointed at the neck, arms and ledgs. She does not come with any batteries.